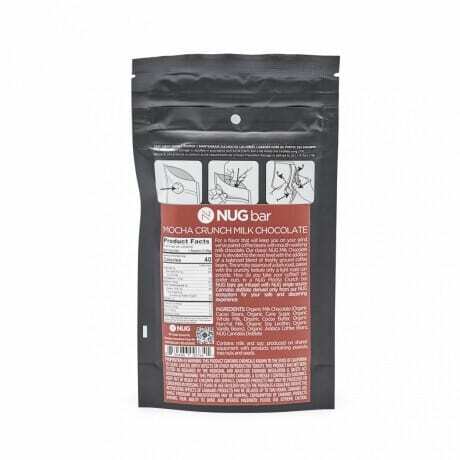 Using organic and Fair Trade certified ingredients, NUG Mocha Crunch bar is 39% cacao with the delicious taste of mocha undertones and a smooth finish. Imagine that delectable bite crafted together with meticulously extracted Cannabis oil, for a flavor that will please your palette and elevate your experience. With 10 mg THC per square, this enticing edible can easily be enjoyed while out conquering the weekend, or at the end of your day.The entire 2oz bar contains 79mg of THC. This delicious bar is perfect for daytime snacking, as you can easily dose for your specific desires. Winner of the 2nd place award at the 2018 Cannabis High Times Cannabis Cup! 100% organic ingredients! Nug Mocha Crunch Bar Delivery in Los Angeles. Kushfly delivers curated selection of cartridges, flowers, edibles, and award winning brands for Adult-Use in Los Angeles. 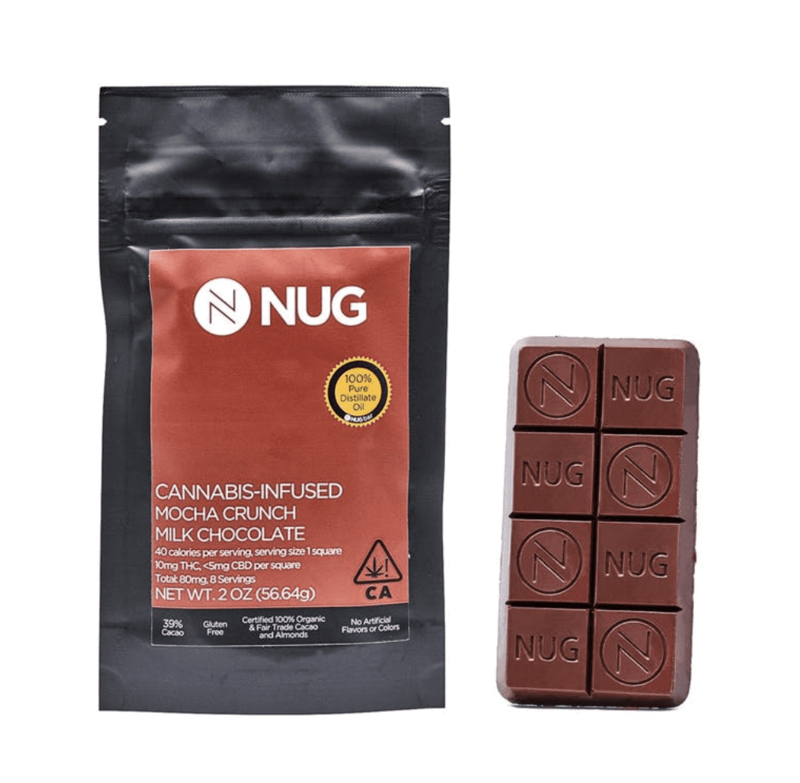 You can order Nug Mocha Crunch Bar Delivery to your door in Hollywood, West Hollywood, North Hollywood, Studio City, Burbank and most cities in Los Angeles. Simply order online, text, or call us at the number provided at the top right side of the website! Delivery to most cities in LA takes under 1 hour. You will receive a tracking link with live delivery updates and ETAs. At NUG we cultivate and extract all our own Cannabis to ensure only the finest quality is used in our product line. All of our products are tested for quality and potency by CW Analytical Laboratories, Oakland, CA. Because of their high potency and delicious edibles, Nug is quickly becoming a crowd favorite. 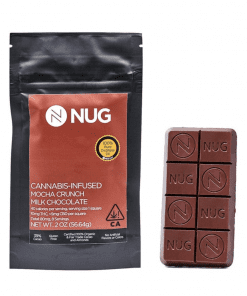 With 10 mg THC per square, this enticing edible can easily be enjoyed while out conquering the weekend, or at the end of your day.The entire 2oz bar contains 100mg of THC. This delicious bar is perfect for daytime snacking, as you can easily dose for your specific desires.